I am a 40-something woman who has a serious problem with collecting journals, either as gifts or those purchased myself. Sometimes I think I need a support group, like Journallers Anonymous. I just love them. I’m in love with them. And I want to talk about them. This is my first blog. I haven’t figured it all out yet. But I’m thinking it will be a fun place to hang out. At least I hope so. P.S. Unless otherwise stated all photos on this blog have been taken by me, as their amateurish nature suggests, and as such I retain the copyright. Please do not use them without permission. Thank you. I just wanted to thank you for subscribing to my blog! I thought I’d come and have a little peek around yours. Thank you very much beckyday6! Yes I am brand new to blogging so I don’t know if my blog is keeping to it’s originally intended purpose, but I am having fun! I also enjoy reading other blogs, such as yours, which is excellent by the way. Thanks for dropping by. Omigosh really? What are those? I’m really green around here! Thank you very much! Don’t worry, I had absolutely no idea either when I got nominated last week 🙂 I googled it to find out what I should do; it’s sort of a “pass the potato” award to help spotlight cool blogs! Thanks Letizia I will google it as well and “pass my potato” as it were. 🙂 Congratulations on your nomination as well. heather…trust me…youre not alone! 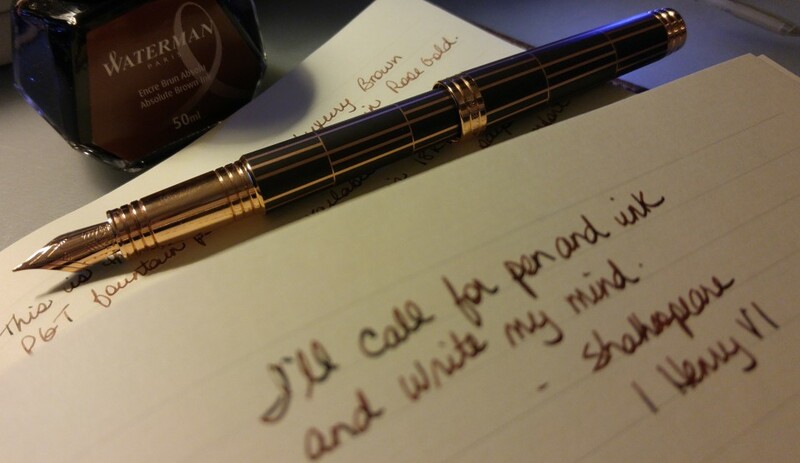 im a journal lover, too….and love writing, using vintage fountain pens if possible! You are welcome! Letizia from Reading Interrupted suggested your blog and she’s right, it’s inspiring. That’s kind. thank you again. I’m so happy to find and follow a blog dedicated to the love of journals, one of my obsessions. I know I’m going to find some great things here. You are welcome! Great site, great products. I noticed you mentioned Wonder Pens in a post (I love that store). Are you in Toronto? If so where do you recommend I shop to satiate my stationary fetish on a student budget? I’ve been meaning to check out Midoco on Bloor near Bathurst but I’d love to know of other destinations. I am not in Toronto, no, but I order from Wonderpens. I wish I could answer your question but I’ve actually never visited your fair city. Best of luck! I would not be any good in your support group. So far from helping you abstain, I would actively encourage you to indulge more. Not only am I something like out of control about beautiful journals and writing in them, but I love it. It is certainly a weakness but not one I have the least interest in correcting. How do you subscribe in a blog? 😦 somebody help me?